New product family: Hollow Shaft Reducers | DamenCNC B.V.
For several years we have been selling planetary gearboxes and worm gearboxes. For many applications these are great solutions. For some more critical applications like a 5 axis head (A, B or C axis), we were looking for a more rigid/stiff solution. We have now added a new line of products which are intended for these more demanding applications. We are starting with 2 frame sizes: 85x85mm and 130x130mm. The smaller frame is intended for NEMA 23 Steppermotors or 40x40mm framesize Servomotors. 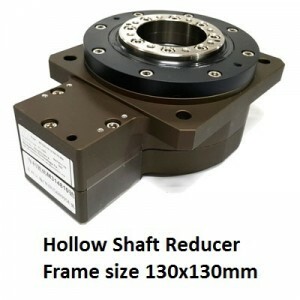 The larger frame size is intended for NEMA 34 Steppermotors or 60x60mm flange Servomotors (14mm input shaft).